EA-8 hosts 3.6% of world’s population but only accounts for 1.5% of total global primary energy consumption (The World Bank 2017; IEA 2017a). With South Africa (the second economy of SSA and an outlier in the region) excluded, this unbalance gets even more pronounced, with 2.9% of world’s population consuming 0.2% of total primary energy. While the share of EA-8 population without access to electricity has fallen from 90% in 2000 to 61% in 2016 (IEA 2017b), the absolute number of people without access has instead increased by eight million as electrification efforts have been outpaced by rapid population growth. Electricity consumption in the region stood at 261 TWh in 2015, with that of South Africa alone at 227 TWh, and the remaining countries having consumed only 34 TWh (IEA 2017a; CIA 2017). Just to provide a comparison, in the same year a high-income country such as Italy consumed 310 TWh of electricity, despite having less than a fifth of EA-8’s population (CIA 2017). EA-8’s energy demand is primarily concentrated in the residential sector (Fig. 2.1), with solid biomass employed for cooking and lighting purposes (on average accounting for 65% of primary energy consumption in the region). This situation outlines a vast potential of energy supply expansion in other sectors such as industry, transport and tertiary. Expanding energy access across EA would bring an array of both direct and indirect benefits, including the improvement of socio-economic conditions (employment, firm profitability), as well as the enhancement of health, agricultural productivity and water access. The poor state of both the electricity grid and of transboundary interconnections in the region, as well as that of other energy infrastructure, represents another critical problem. Existing infrastructure predominantly serves urban centres hosting the minority of the population, while its majority, dispersed over large rural areas, has to satisfy its energy need largely through solid biomass (Fig. 2.2). Biomass includes wood fuels, agricultural by-products, and dung, usually collected at the household level or traded in informal markets, and it is employed for the bulk of cooking, lighting, and heating activities. The only exception to this trend in the region is represented by South Africa, where coal dominates the energy mix. A range of adverse socio-economic and health effects result from the consumption of traditional biomass. Such impacts have been extensively documented in different spheres (see Bandyopadhyay et al. 2011), with particular attention on the resulting indoor air pollution. 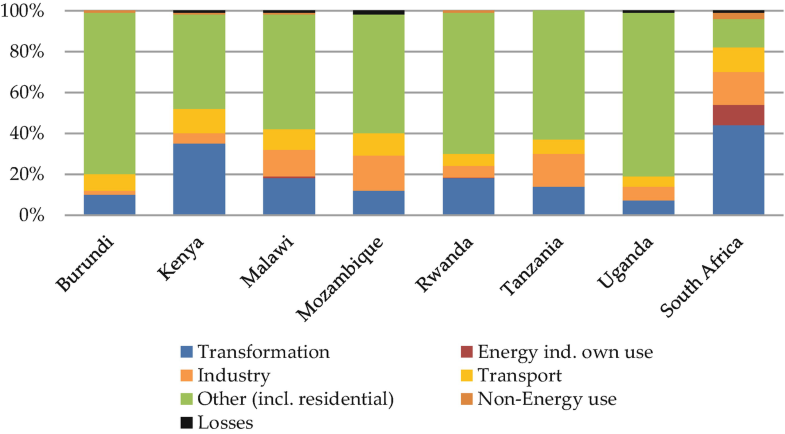 Other issues connected with biomass consumption range from productivity losses due to the burdensome and time-demanding fuel collection process (especially among women and children, refer to Biran et al. 2004) to health concerns at both collection and consumption phases1; from increasing rates of environmental degradation to the very low energy efficiency resulting from households’ rudimentary equipment. There is robust evidence that indoor air pollution has led to around 120,000 death in EA-8 countries in 2016 alone (IHME 2017). Figure 2.3 provides an overview of the magnitude of the mortality burden in each EA country. 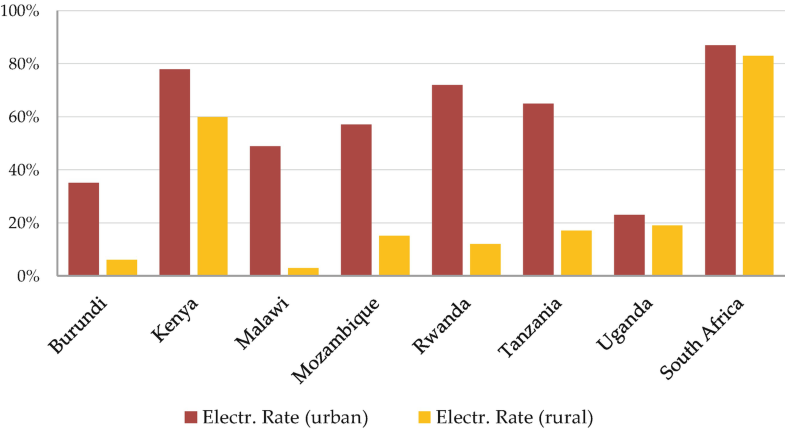 At the same time, access to electricity across EA-8 currently averages 35% (or 28% without South Africa), with 150 million people without access and notable rural-urban inequality in most countries (Fig. 2.4). Hydropower is the dominant source in the electricity generation mix of Burundi, Kenya, Malawi, Mozambique, Tanzania, and Uganda (Fig. 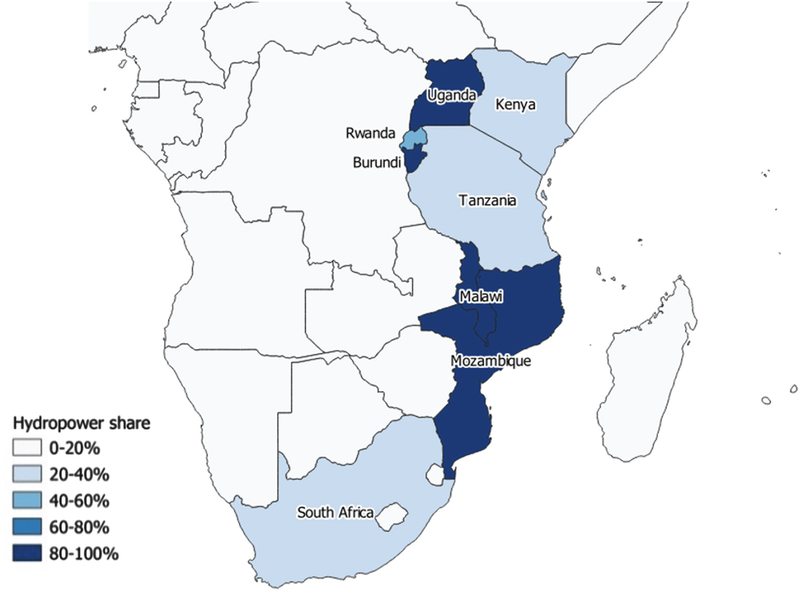 2.5), with Mozambique and Tanzania still having large untapped potential. Overall, total installed hydropower capacity in EA-7 stands at 3 GW. South Africa leads by far in terms of coal generation, with an overall coal-fired capacity of 40 GW. Given the current situation, a well-managed and long-sighted energy development and electrification plan throughout EA-8 would not only represents a step forward in achieving greater energy access (SDG 7), but also accelerate the realization of other development targets. Multiple international institutions (UN, IEA, World Bank) have agreed that initiating a transition to modern energy on the scale implied by the ambitious electrification targets set by EA countries (Table 2.1) will require the development of a portfolio of diverse technologies, energy sources, and grid expansion solutions, each specific to its own context. As the next chapters will show in detail, EA-8 countries are endowed with substantial energy resources and technical generation potential (Table 2.2): solar PV potential is abundant and widespread throughout the region, and overall it stands at 219,500 TWh/year.2 CSP (gross 176,000 TWh/year in the region) is mostly feasible in South Africa and Kenya. Untapped hydropower, both at large and small scale, is found to varying degrees in all countries except South Africa. The same is true for geothermal, in particular in the northern part of the Rift Valley area shared between Kenya, Uganda and Rwanda and further down south in Malawi. Wind potential stands at 16,600 TWh/year (considering areas with a wind turbine capacity factor greater than 40%). Bioenergy for generation purposes is a further viable option, mostly in South Africa and Kenya. 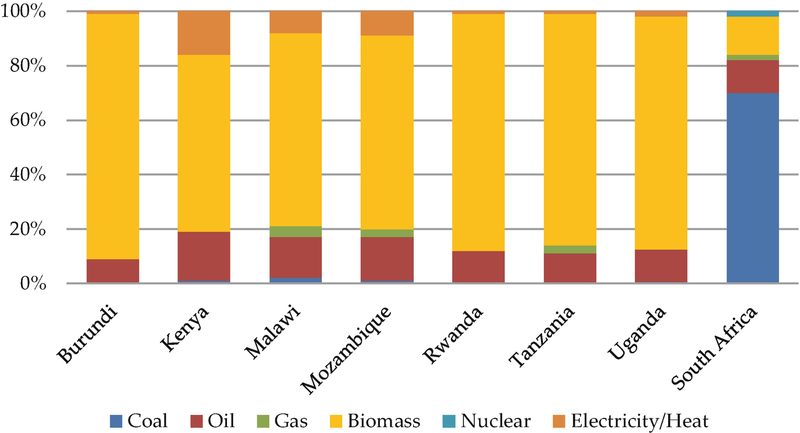 Hydrocarbon resources are also abundant, but their distribution is highly skewed: Uganda is the only country with substantial oil reserves (standing at 2.5 billion barrels), as those of Kenya and South Africa are less prominent or less accessible; the NG endowments of Mozambique and Tanzania are large (together they sum to 4200 bcm), while those of Rwanda and South Africa are only partially viable. 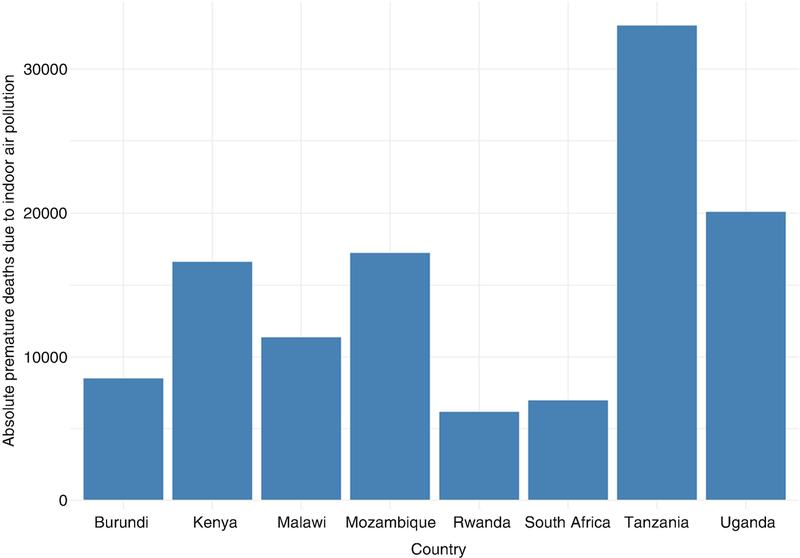 Finally, South Africa is the richest country in terms of coal resources (with reserves standing at 35 billion tons), while mining activity is also taking place in Mozambique (which could have more than 20 billion tons of reserves), Malawi, and Tanzania. Irrespective of energy resources endowment and RE potential, as of today all EA-7 countries (i.e. 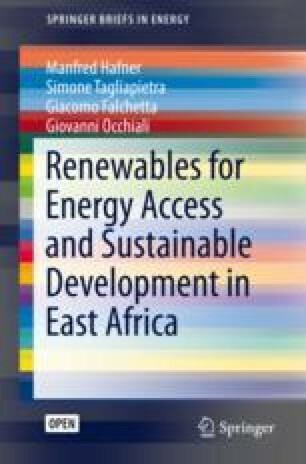 with the exception of South Africa) share a structural lack of secure and universal energy access, while regional energy development processes face several barriers connected to various technological, economic, financial, institutional, political, and social issues. All these dimensions will be discussed throughout this book. For instance, variable renewable energy (VRE) sources such as solar PV and wind power require firming, which entails either interlinked networks, flexible backup supplies, storage and or demand response. Large-scale storage of electricity is technologically possible but expensive and challenging at grid level scale. As VRE potential is brought on-line, additional investments will hence be required to ensure high degrees of grid and supply reliability. Nevertheless, hitherto national and local governments have lacked an effective governance (and the financial means) to give the onset to a process of diffused electrification exploiting domestic potential. Greater public-private and local-international coordination are required to ensure effective policy support for exploiting this untapped capacity in order to bring more RE on-line. Particularly in rural areas, roadblocks of different kinds are faced. Not only there exist heavy financial and geographical barriers to the extension of the national grid, various issues are also encountered when communities and households face the decision of whether to invest in appliances and local grids such as solar home systems or small hydro networks. In such cases, the available incentives and subsidies, payment methods or schemes, combined with collective behaviour and social norms, are the defining factors for appliance adoption. Thus, there is a need to ensure effective communication across stakeholders to clearly understand the implications of policy support to deploy private capital in electrification projects. Digital technologies can play an important role in this sense. While private companies are starting to gain a relevant market share in EA-8, with 140 million USD raised in the region in 2015 alone, more than half of the global total (REN21 and UNIDO 2016), there is still a long way to go to achieve energy security. International investors, including China, the World Bank and the African Development Bank, are playing a significant role in the process of addition of large capacity projects and grid extension. However, the effectiveness of their investment is often not maximised because of country specific institutional and policy factors. Thus, there exists a tight link between local policy and politics, financial support and international cooperation. In this context, the next chapters provide a more detailed insight into the specific energy situation in each country, as well as into their RE potential, resource endowment, and policy frameworks in place. This background is then employed to produce least-cost full electrification scenarios and model them within an electrification tool (OnSSET), to later discuss the key technical, economic, and policy challenges faced by policymakers in the exploitation of untapped RE potential in the region. The earlier because of the dangers of injuries, the latter through the breathing of combustion gases, chiefly CO, particulate matter, and biogenic volatile organic compounds, as well as burning injuries. The following RE potential figures are drawn from (IRENA 2014), and they consider gross technical potential in all suitable areas (i.e. they do not account for economic viability). Hence, the figures are interesting in comparative rather than in absolute terms.